Fences come in a variety of materials and finishes including wood, iron, vinyl, aluminum, and chain link. Each has its own set of advantages and disadvantages. Vinyl fences have become popular in recent times due to their versatility and affordability. Cornerstone Fence and Ornamental Gate of Connecticut installs vinyl fences in different colors and textures. They need very little maintenance and do not have to be painted or protected from termites and rot and are almost worry free. Now vinyl fences come with warranties for many years and after they outlive their utility, they can be recycled putting to rest fears of impending ecological danger. They are the ideal choice for homeowners who do not have the time nor interest in periodic maintenance of their fence. Vinyl is nearly five times as strong as wood and thus it takes much more to bring down a vinyl fence than a wooden one. The flexibility of vinyl makes it a good choice in places that witness extreme weather conditions such as strong winds and rain. Wood fences are more likely to break and collapse in such weather. Vinyl fences are also preferred in seaside locations which see a significant amount of salt water exposure. They are also suitable for fencing in animals like horses as the animals can neither chew through it nor hurt themselves if they attempt to run through it. 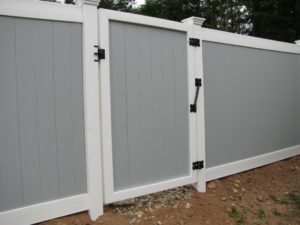 The installation costs for vinyl fencing are much less than wood or iron and maintenance costs are next to nothing.A general cleaning with soap and water is sufficient to keep your vinyl fence looking like new Vinyl will not change or lose its color and there is no need to repaint it for protection from rot and rust and termites won’t cause damage either. Vinyl fencing is non-toxic because it is not treated with harmful or hazardous chemicals. Since it can be recycled, there is no waste involved. Vinyl consists of 51 percent of chlorine which is derived from salt, and 49 percent is made from hydrocarbons that are derived from natural gas. Cornerstone Fence and Ornamental Gate of Connecticut is a family owned and operated, full service fence contractor, based in Meriden CT. We have been proudly serving the states of Connecticut, Massachusetts, New York and Rhode Island for over thirty years. We take pride in the efficiency of our work; as well as our premium service. Contact us today to learn more about your vinyl fencing project.